Metoprolol also reduces the force of contraction of heart muscle and thereby lowers blood pressure. By reducing the heart rate and the force of muscle contraction, metoprolol reduces the need for oxygen by heart muscle. Since heart pain (angina pectoris) occurs when oxygen demand of the heart muscle exceeds the supply of oxygen, metoprolol, by reducing the demand for oxygen, is helpful in treating heart pain. The FDA approved metoprolol in August 1978. Treating high blood pressure, alone or with other medicines; long-term treatment of chest pain; and certain types of heart failure. It may also be used for other conditions as determined by your doctor. 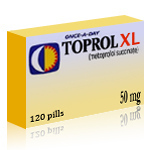 Toprol XL Extended-Release Tablets are a beta-adrenergic blocking agent (beta-blocker). It works by reducing the amount of work the heart has to do (reduces chest pain) and the amount of blood the heart pumps out (lowers high blood pressure). It is also used to stabilize the heart rhythm in conditions in which the heart is beating too fast or in an irregular rhythm. This drug works by blocking the action of certain natural chemicals in your body (such as epinephrine) that affect the heart and blood vessels. This results in a lowering of heart rate, blood pressure, and strain on the heart.